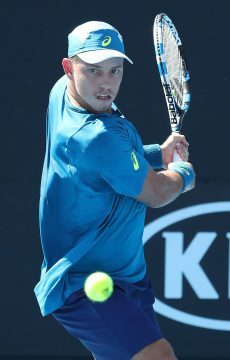 Alex De Minaur and Jordan Thompson won all-Aussie affairs to set up a second-round meeting at the Brisbane International, after defending champ Nick Kyrgios and Ajla Tomljanovic began their campaigns on a winning note. 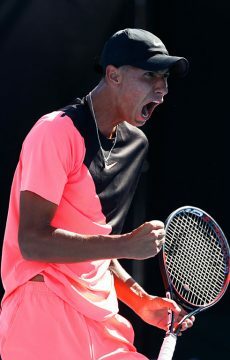 In a showcase of the future of Australian tennis, Alex De Minaur brushed fellow teenager Alexei Popyrin aside under lights at Pat Rafter Arena in Brisbane. 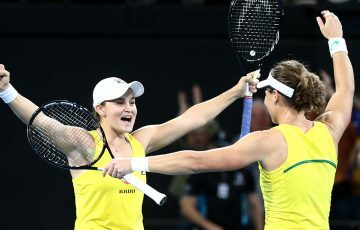 The former Australian Junior Davis Cup teammates – both 19, both hailing from Sydney, and both having developed their games in Spain – were neck and neck early before the seventh-seeded De Minaur romped to a 6-2 6-2 victory. Earlier on Tuesday, Nick Kyrgios beat Ryan Harrison for the second straight year in Brisbane to advance to the second round. The eighth seed and defending champion missed three match points in the second set yet refocused to win 7-6(5) 5-7 7-6(5) at Pat Rafter Arena. 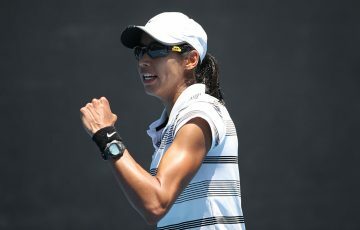 On a day Australia had 11 singles competitors in action at the Brisbane International, Ajla Tomljanovic was the first victor. The Croatian-born Aussie recovered to beat Katerina Siniakova 1-6 6-3 6-0 to advance to the second round. 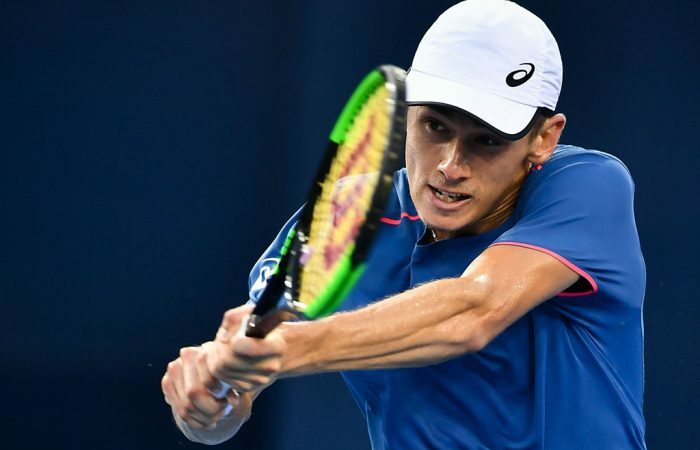 Last year a semifinalist in Brisbane, De Minaur returned to Queensland Tennis Centre with a far bigger profile and in a far different position on tour compared to 12 months ago. 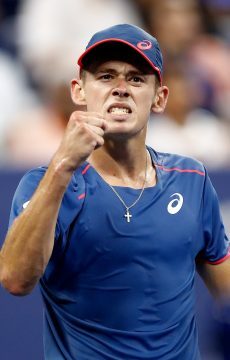 He had to contend with a free-swinging Popyrin in the first few games of the match before eventually settling and using his explosive speed and admirable consistency to wear the wildcard down. De Minaur opened up a 6-2 4-0 lead before Popyrin got on the board and made the second set more of a contest. Yet the world No.31 broke back immediately after dropping serve in the sixth game and completed victory in exactly an hour. “I’m incredibly happy to be back here – I mean this is where it all started for me and it just feels amazing playing on this court in front of these amazing fans,” he said during his on-court interview. “Once you have that full year on tour you’re sort of used to playing these matches and you don’t come into court as nervous. De Minaur next faces Jordan Thompson, who won another all-Aussie affair over Alex Bolt. From 3-3 in the first set, Thompson reeled off nine straight games to run out a 6-3 6-0 winner. 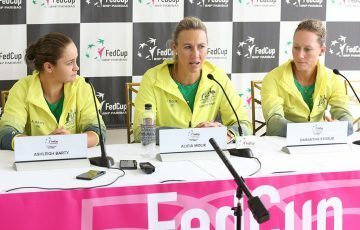 “It’s actually probably one of the first times I’ve had to play Aussie players,” said De Minaur. Kyrgios remains undefeated in four meetings against Harrison, but this was by far their closest encounter. 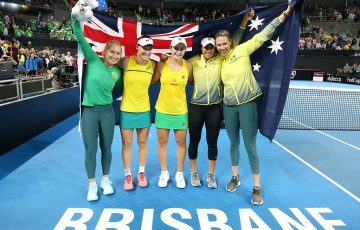 In a rematch of the 2018 Brisbane final, the Australian played a streaky match, interchanging sluggish periods of play with flashes of focused brilliance to take the opening set. 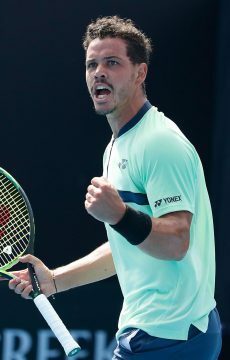 Harrison faced a pair of break points in the eighth game of the second and stared down three match points when trailing 4-5, 0-40, yet served his way out of trouble and broke Kyrgios in the 11th game to ultimately force a third set – the first time he had ever taken a set off Kyrgios. Kyrgios then received treatment on his right knee but did enough to ensure victory, helped by an incredible tally of 44 aces. Kyrgios with a powerful serve and that's the match! “I know my serve is a shot that usually gets me through tough matches,” Kyrgios said on court after winning in a touch over two hours. “I was very rusty from the back of the court. I didn’t hit too much over the off-season. But just happy to get through and I know I’ve got a touch match coming up. Next up for the Canberran is a meeting in the last 16 with Frenchman Jeremy Chardy. 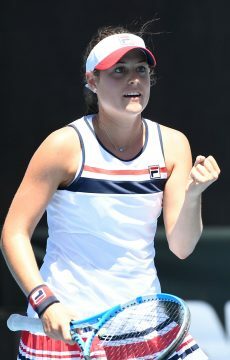 At the same stage of the women’s tournament, Tomljanovic will meet Johanna Konta, who upset No.3 seed Sloane Stephens in straight sets at Pat Rafter Arena earlier on Tuesday. Tomljanovic and Konta will clash in the second round in Brisbane for the second straight year; 12 months ago the Brit triumphed in three tight sets. Yet Tomljanovic was ranked outside the top 100 then; this time around she’s the world No.46 after a career-best season during which she reached two WTA finals. Before De Minaur’s feature night match at Pat Rafter Arena, it was Destanee Aiava firmly in the spotlight when she took on US Open champion Naomi Osaka on the same court. Aiava, a qualifier, entered the match on a four-match winning streak but found the second seed too relentless and consistent; Osaka rolled to a 6-3 6-2 victory to seal a spot in the quarterfinals. 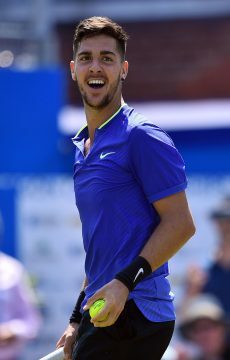 At the same time across on Show Court 1, Thanasi Kokkinakis had chances against former world No.5 Jo-Wilfried Tsonga before bowing out in two tight sets. Like Aiava, Kokkinakis came through qualifying to reach the main draw, and he led in the first set against the Frenchman, breaking serve in the ninth game to serve for it when up 5-4. 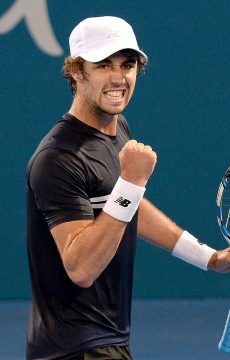 He was unable to do so, however, and also missed a set point in the ensuing tiebreak before Tsonga snatched it. Tsonga, making his way back after an injury-marred 2018 and currently ranked No.239, went on to win 7-6(6) 6-4. Earlier on Tuesday, wildcard James Duckworth fought hard but fell to former world No.1 Andy Murray. Duckworth extended the Scot to four sets when they met a few months ago in the first round of the US Open. This time, Murray was again the more polished performer, running out a 6-4 6-3 win in just under 90 minutes. On Show Court 1, Daria Gavrilova fell 6-3 6-3 to No.8 seed Anastasija Sevastova. Sevastova goes on to play British qualifier Harriet Dart, who scraped past Australian wildcard Priscilla Hon in three sets on Monday.